The art expo starts on Thursday at 4.30 pm for VIP’s and general public. On Thursday the expo ends at 9.30 pm. Opening hours on Friday and Saturday are 10.30 am till 9.30 pm. Sunday from 10.30 am till 7.00 pm. 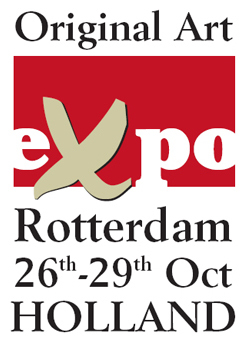 Original art EXPO 26th till 29th October 2006 in Rotterdam Holland. In October 2006 artist and public come face to face for 4 whole days. From the 26th till the 29th of October Promotie Advies is organizing an Art EXPO with the Van Nelle Design Factory as its setting in Rotterdam. In this historical building, where once coffee was roasted, you can both display and sell your works of art. The Van Nelle Design Factory is situated close to the A20 motorway and is clearly signposted. Parking does not present a problem as there is adequate on street parking (free) as well as site parking (paid). We are able to offer you a unique location and the opportunity to show and discuss your art with a live audience. The spacious exhibition hall (4,000 m2) will be fitted with 6m2 stands. There will be a cafetaria corner with an indoor terrace for visitors to enjoy a beverage, or to grab a bite to eat and listen to music. To promote this Art EXPO we intend to advertise in national, area and business newspapers as well as via local and national radio airtime. In Rotterdam itself we will display posters. We plan to do our utmost to draw a wide audience. You can be a part of this 4 day international art EXPO for the sum of € 453,78 per stand van 6 m2. All the latest news concerning the art expo will be published there.